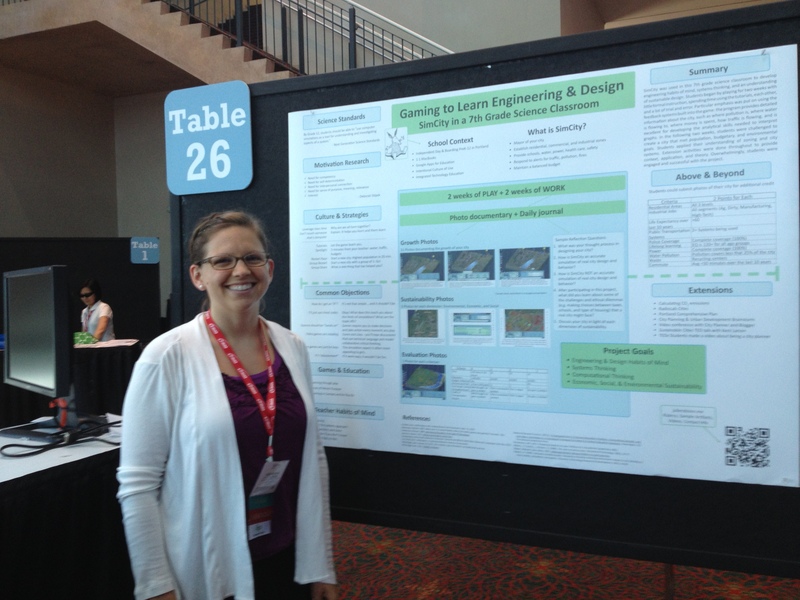 Yesterday evening I presented my SimCity project here at ISTE 2013. (You can find all the info on the conference resources page – please feel free to remix and reuse!) It was definitely a highlight of this conference for me, not just because I got to talk about my favorite work that I’m doing but because of the connections I made with other teachers and tech coordinators. There are two connections that I’m really excited about though they are very different. The first connection is with two teachers from Phnom Penh, Cambodia, who teach at a small boarding school for Cambodian students. It would be fascinating for our 7th graders to video conference with them to discuss the ideas of urban planning and design. What interesting perspectives they would have on city development and infrastructure! The second connection is with a teacher from Quest2Learn, the gaming public school (OOPS! – I initially posted that it was a charter) in NYC, and his referral to SimCityEDU. I thought it was just a forum for teachers to post lesson plans, but it sounds like the Institute of Play is actually taking SimCity5 and modding it to provide scenarios that teachers can modify for their classes. It might then offer feedback to the student and teacher about how they are interacting with the system. This means that I could see evidence of systems and design thinking rather than just believing that this project is effective. Presenting my poster also affirmed the value of having other perspectives on your work. One visitor said that he no longer uses the word work in his classroom, but calls it purposeful play. It sounds like a small, semantic difference, but I do believe words matter. I think the poster sessions are the hidden treasures of the conference because you get to see all kinds of different projects in different phases of development and you get to talk to the people doing them. As a pragmatic person, I appreciate seeing lesson plans and rubrics because I’m always thinking about the literal how-to of a project. Speaking of pragmatic, next time I present a poster I will remember to bring my own video adaptor and push pins!